When does a schoolboy comic figure become a literary character? Perhaps when the pre-teen reader turns to his magical years in nostalgia as an older man. The events are now a plot and the dramatic personae are now characters. More still, you begin to see the authors behind the words, the curiosity of the creator behind the sketchy visage of the protagonist he has created. Tintin came back to me this week in three dimensions. Make that four, as the special glasses borrowed from the multiplex staff was supplemented by an Einstenian fourth. Time. Memories come tumbling, and suddenly, two facets emerge. One is of how a book reader, more so a schoolboy, essentially paints the works he consumes with his own vivid imaginings -- and then does his own editing. Every comic box in a graphic-novel mind is as dwellable or as skippable as one chooses to do. I remember Snowy and his dogly antics. The little corners of the frame were always special for Tintin lovers for the cute white thing in very wordly wags of the tails, discoveries of the nose and the little politics pets play with other non-human animals. They were largely intact in Spielberg's audacious remake. So was the curiosity of Tintin. It turns out Tintin is us. Or, if you please, Mr. Herge. I remember that my first visit overseas was to Belgium, where, a complete desi lost in a European autumn, I groped for comfort. 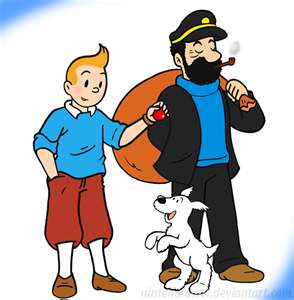 And then I learnt Tintin was Belgian. I stayed in a hotel run by South Asians and it overlooked a chocolate factory on top of which lay the icon of the intrepid reporter with the tuft. Suddenly, I felt I was staying at a cousin's place. And then, there is Captain Haddock, making his debut, in the comic book and in the world of cinema, as the secret of the Unicorn unravels. Now, there is a twist in the tale that never really changed. 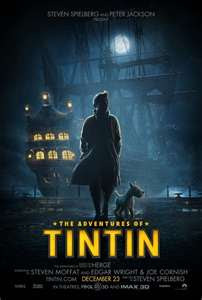 I now see Tintin as a Western character with a cultural location in Francophone Belgium, poking fun at the British Scotland Yard in a humour that now has shades of European rivalry. I now see the bumbling Thomson and Thompson twins as a caricature. We have, you see, a French author who takes a Sherlock Holmes agency and turns it into an Enid Blytonian Mr. Goon in the form of fumbling Scotland Yarders! Exotic locales in Morocco now tell me the tale of colonialism. And suddenly I imagine George Clooney playing the main role in a remake of Casablanca, colourfully remade to capture the spirit of Humphrey Bogart in a different age. My ideas fly in different directions -- though the story is the same. Bianca Castafiore now reminds me of Tansen's lighting of the lamp with his song, and, as she breaks a glass case with her operating highs, I think of the masterly way in which the author combines the classical excellence of her art with the popular imagination that hears comical sounds in her falsetto sounds. And then I see Captain Haddock. The crazy man with a fantastic vocabulary for creative abuses is in my mind now a loser with a strong work ethic and a sense of family pride. I see him in a different world, the stuff of serious literature, not comic books. The seafarer and his lonely quests overpower the billions of blistering, blue barnacles in my mind. Did Herge read Joseph Conrad, I wonder. Beyond the 3D magic, the action-packed climax, the sights and the sounds in the etching out of the action sequences that I used to kind of skip in my schoolboy visitations of Tintin -- and the sheer razmatazz of a Spielberg movie -- I rediscover Captain Haddock, lonely and proud, lying in the bottom of the sea like the lost treasure that goes with the secret of the Unicorn. I am Tintin, still,looking for new clues.